For Directions and Parking click here. Our liturgical style and practice. We value the full depth and breadth of the Anglo-Catholic tradition, with the understanding that sacramental, incarnational worship is central to our life in service to God. We reverence the beauty and awe of the Holy Mysteries. In addition to Sunday masses (low mass at 8 a.m., solemn high mass at 10:30 a.m., both Rite I), there are weekday masses and a monthly Marian mass. On Festival Sundays there may be a Eucharistic procession or Choral Evensong with Benediction. Our music program fully supports and enriches the worship. The choir, which is gaining recognition as one of the best small choirs performing anthems and motets in San Diego, consists of volunteers and four paid soloists, and also leads the congregation in the Ordinary of the mass. We have a noted organist-choirmaster. All Saints' has always appreciated a homiletic approach that emphasizes inspiring Bible teaching, the centrality of worship, and the implications of Christian teaching for the individual and corporate life. All Saints' has never welcomed the mixture of religion with politics. Our social life emanates from our worship life, not the other way around. As a religious community of this kind, we do not accept an "agenda" that might be put forward by a special interest group of any type. 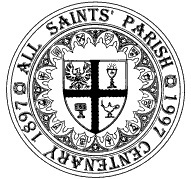 All Saints' Episcopal Church began as a mission of St. Paul's Episcopal Church in 1896 and became an independent parish in 1906. It has occupied its current position, the corner of Sixth and Pennsylvania Streets in Hillcrest, since 1899. It is probably the oldest non-Roman-Catholic church in San Diego--the church that has existed for the longest time at the same location. When it began, it was the only church between downtown San Diego and Old Town. The continuous interest of its parishioners has allowed it not only to survive but also to flourish. The congregation--a rich mixture of men and women of all ages and many ethnicities--has supported and beautified the church throughout its life. The church's complex of buildings includes a pre-school, offices, meeting rooms, a parish hall (constructed in 1924), and the church itself. The church was built in 1912 from the designs of William Sterling Hebbard and Carleton Monroe Winslow. Hebbard, the principal designer and a member of All Saints' congregation, remains one of the two most important architects in San Diego history. Winslow is notable as a designer of a number of prominent buildings, including several of the original exposition buildings in Balboa Park. The interior of the mission-style church, a monument in its neighborhood, has changed little since 1912, except for the addition of stained glass during the 1950s and 1960s. The windows were created by the Judson Studios of Los Angeles, the most prominent makers of stained glass on the west coast, and perhaps in America. The 32 windows form a unified collection in which one can trace both the history of the Christian church and the devotional life of the individual soul, each in its manifold character and stages of existence. The atmosphere of All Saints' is as appropriate for private meditation as it is for music and congregational worship.